IBM Watson team introduces new services, details evolved capabilities, forecasts market opportunities. But we’re still hungry for real-world success stories. IBM’s Watson unit keeps developing new offerings, growing its ecosystem and explaining the big opportunities ahead. If only it could share more of the customer case examples that remain under non-disclosure agreement (NDA) wraps. What would-be customers really want to see, after all, is examples of Watson clobbering real-world problems the way it trounced its puny human competitors in “Jeopardy.” But to be fair, a lot of building, learning, refining and ecosystem building is required when starting a business from scratch. At the first IBM Watson Analyst Day held this week in Cambridge, Mass., the conversation was mostly about how IBM is setting the stage — a very big stage — for cognitive business. 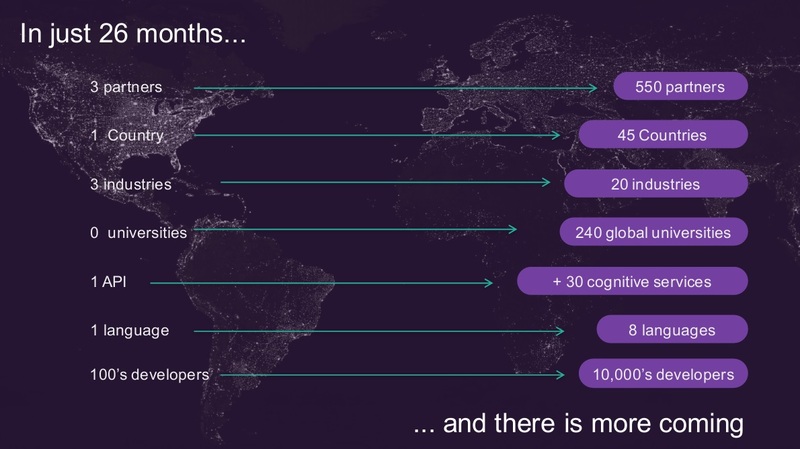 In the two-plus years since it was established as its own commercial business unit within IBM, IBM Watson has gone from addressing three industries to 20 industries, from doing business in one country to 45 countries, from one language to eight languages, and from three partners to 550 partners. Instead of talking about big, high-profile cognitive projects spearheaded solely by IBM, the company is increasingly talking about the portfolio of cloud-based cognitive services that can be exploited by the growing developer community. Where Watson began with one application programming interface and hundreds of mostly internal developers, today there are more than 30 APIs and tens of thousands of developers, IBM said this week. Sentiment and Insight services. In a collaboration with Twilio, IBM this week introduced IBM Watson Message Sentiment and IBM Watson Message Insights. Pre-integrated with Twilio’s APIs, the services use sentiment analysis to detect sentiment in SMS streams at scale, in the case of Message Sentiment, and to distill the key meanings of messages, in the case of Message Insight. Learning Korean. In a an agreement with SK Holdings C&C, a Korean IT services company, IBM Watson will be trained to understand Korean so South Korea-based developers can use localized APIs and services to accelerate the creation and deployment of cognitive applications. Machine vision and voice analysis. IBM merged its AlchemyVision and Visual Recognition services to power a unified Watson Visual Recognition API. Separately, Watson Tone Analyzer for spotting snark, sadness, elation and other emotions in text is now generally available. In addition to adding new APIs and services, IBM is also tinkering with the packaging of existing solutions to make them easier to consume. For example, Watson Engagement Advisor (WEA), which debuted in 2013, has had a makeover. WEA is designed to improve the customer service experience by assisting service agents or interacting directly with customers in complex service scenarios. IBM said this week that Engagement Advisor has been decomposed into more granular, developer-ready services that are pre-trained on common customer-service needs and intentions. An integration framework was also added to make it easier to connect to common applications and data sources. Where Engagement Advisor deployments initially averaged six to nine months, time to production has been shortened considerably, says IBM. What’s more, the new tooling makes it more of a self-service proposition that than something requiring consulting support. Healthcare. Healthcare has been the top industry priority from the earliest days of Watson, so Watson Health was split out as a separate unit within IBM Watson. In fact, this week’s event was held at the just-opened Watson Health headquarters. IBM sees a $200 billion opportunity for Watson within the $8 trillion worldwide healthcare industry, so it has invested heavily in data drive cognitive healthcare solutions. This week we heard a bit about how the acquisitions of Truven, Explorys and Phytel have helped create one of the world’s largest collections of health data. That data is fuel for the IBM Watson Health Cloud and its analytics, image analytics and knowledge platforms. Cyber security. Earlier this month IBM announced Watson for Cyber Security. The average company faces some 200,000 security events per day, including everything from network hacks and viruses to routine logons and user-access requests. A central tenant of Watson Cyber Security is learning to distinguish between ever-changing real threats and false positives so the technology can filter out the latter and free security professionals to focus on real problems. Toward this end, IBM is integrating its Watson for Cyber Security with the IBM QRadar SaaS app and IBM X-Force threat-intelligence database to give Watson rich troves of ever-evolving data to power cognitive security analyses. Internet of Things. Not all IoT applications call for cognitive capabilities, but IBM sees a fit wherever there’s human-to-machine interaction at scale. For example, cognitive is envisioned in cognitive route-planning services that will combine real-time and historic data with traffic, weather and social event data, like concerts and ball games, to predict better routes. In another example, a steel plant customer of IBM’s it interested in a wearables application in which foundry workers are fitted with sensors so Watson can detect and alert managers to early signs of heat stroke. The one key factoid missing from this week’s event — one that Constellation Research advisory customers ask us about — is how many customers are successfully using IBM Watson in production? IBM doesn’t share such statistics, but analysts were recently given an NDA peek at industry use case and real-world customer examples. Nearly a dozen major companies were cited by name in this March briefing. I came away impressed, so I was a bit disappointed this week when customer citations and examples weren’t on the agenda. As for IBM’s focus on delivering more granular, digestible services and enabling an ecosystem, these are good moves that will spread the burden of building what is more than just a new business unit. As IBM has described it, cognitive is a whole new era for computing. The good news is that IBM is no longer going it alone. Systems integrators, in particular, have been introducing cognitive capabilities over the last year. In some cases the offerings might not fit IBM’s definition of cognitive — being closer to combinations of automation, robotics or artificial intelligence techniques. But the development work and conversation has begun, and competition will be nothing but good for this nascent market.